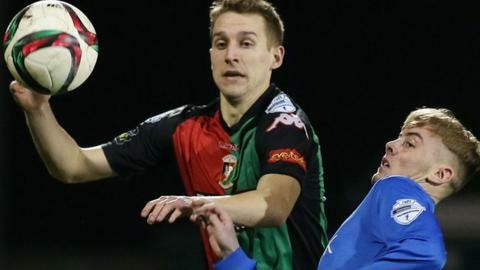 Glentoran avenged their recent Irish Cup defeat by Glenavon with victory in Monday's Irish Premiership match. Striker Curtis Allen put them into an 18th-minute lead with a shot inside the far post with Kevin Barniff equalising 10 minutes into the second half. Allen scored again in the 68th minute winner by running on to a long ball and drilling a low shot from 18 yards. Jonathan Smith made it 3-1 for the Glens in stoppage-time with Allen missing a penalty right at the end. The spot-kick was awarded when Glenavon substitute Andy Kilmartin fouled Smith in the area. It gave former Linfield striker Allen the chance to complete his hat-trick but he struck the bar with the spot-kick. As well as gaining revenge for the 4-1 home defeat in the sixth round of the Irish Cup nine days earlier, the result ended a run of four successive Premiership defeat for the Glens. For fourth-placed Glenavon, it was a first defeat in nine league matches. This Saturday Glentoran host Ballymena United in the league while Glenavon are at home to Portadown in the Mid-Ulster derby. Glentoran's Curtis Allen: "We had been poor over the last month - some of our performances were embarrassing. "We want to get something out of the season, there are still points to play for and still routes to get into Europe. "Tonight is a good platform for us. The win was thoroughly deserved for the work we put in." Glenavon manager Gary Hamilton: "Glentoran deserved it. They worked harder and wanted it more than us. "Maybe two matches in four days was a bit much for us, I don't know. Our boys looked lethargic."